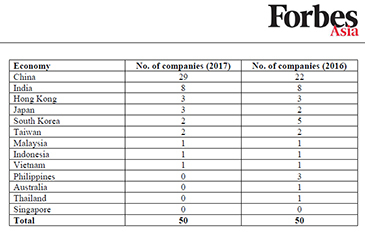 SINGAPORE (August 24, 2017) — The 13th annual Forbes Asia’s Fabulous 50 List of the best publicly traded big companies honors corporate stars across the Asia-Pacific region. This year, China is in the spotlight as a record 29 companies are headquartered on the mainland, up from 22 last year. The list also features 20 new entrants. The full list can be found at www.forbes.com/fab50 and in the latest issue of Forbes Asia, available on newsstands now. The “Fab 50” companies are selected from a pool of 1,694 public companies in the region with at least US$1.8 billion in annual revenue. Companies that are losing money or whose revenue is less than it was five years ago do not qualify. The list also excludes companies that have a high debt ratio, are more than 50% state-owned or more than 50%-owned by listed parents. Companies are then analyzed using a battery of more than a dozen financial measures. The result is a stellar lineup of high-performing blue chips, the region’s best of the best. China boasts the two most valuable companies on the list - Alibaba Group and Tencent Holdings, with market capitalizations of $399 billion and $387 billion respectively. These two companies are also ranked first and second in terms of net profits. In addition, 11 of the 20 new entrants to the list are from China, underscoring the deep pool of entrepreneurial talent there. Cogobuy Group, the largest e-commerce marketplace serving China’s electronics manufacturing industry, makes its debut on this year’s list. Founded in 2010 in Shenzhen and listed in Hong Kong in 2014, it managed 6,000% revenue growth in five years. In July, Cogobuy, together with three other Fab 50 companies – Baidu, Alibaba and Tencent, joined China’s first industry alliance to break into the booming artificial intelligence industry. Other Chinese newcomers include soy sauce producer and seller Foshan Haitian Flavouring & Food, internet retailer Vipshop Holdings and courier services company S.F. Holding. Also making its debut, India’s Rajesh Exports has the highest revenue on the list with $36.1 billion. The world’s largest gold company, which has operations from mining and refining to wholesaling and retailing, has seen its revenue jump sevenfold in five years. Started by brothers Rajesh and Prashant Mehta, it has refineries in Switzerland and India, and a retail chain under the name Shubh Jewellers. It plans to expand from the current 80 stores to around 500 in three years. InterGlobe Aviation, which operates India’s largest passenger airline IndiGo, and crop-protection company UPL also demonstrated stellar growth, earning them spots on this year’s list. Other notable newcomers include Li Ka-shing-chaired property developer Cheung Kong Property Holdings. One of the largest developers in Hong Kong, the company has commercial and industrial properties at home and across mainland China, Singapore, the UK and the Bahamas. Mixi, a mobile gaming company from Japan, started as a social-networking service in 1999 but saw a turnaround when it launched its iOS-based mobile game Monster Strike in 2013. The company’s shares rose by 191% in 2014 and has continued to see most of its revenue originating from its mobile game segment. South Korean Internet services firm Naver and the country’s second-biggest semiconductor manufacturer SK Hynix feature on the Fab 50 list. The latter’s revenue is expected to hit $25.2 billion this year, 180% higher than in 2012. Taiwan has also two companies this year, while Indonesia and Malaysia each have one company on the list. The sole Vietnamese company to make it to this year’s list is newcomer Mobile World Investment. Founded in 2004, the company, which sells mobile phones and electronics devices, has maintained an annual revenue growth rate of more than 60% since its IPO in 2014. There are no companies from Australia, the Philippines, Singapore and Thailand on this year’s list. For more information on the “Fab 50” list, visit www.forbes.com/fab50.